Relation of Tables or Figures and Text. Because tables and figures supplement the text, refer in the text to all tables and figures used and explain what the reader should look for when using the table or figure. Focus only on the important point the reader should draw from them, and leave the details for the reader to examine on their own. Organization, Consistency, and Coherence. Number all tables sequentially as you refer to them in the text (Table 1, Table 2, etc. ), likewise for figures (Figure 1, Figure 2, etc.). 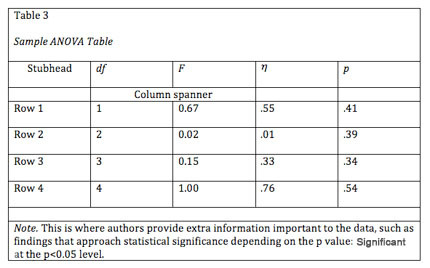 Abbreviations, terminology, and probability level values must be consistent across tables and figures in the same article. Likewise, formats, titles, and headings must be consistent. Do not repeat the same data in different tables. Is the entire table single- or double-spaced (including the title, headings, and notes)? Are all comparable tables presented consistently? Is the title brief but explanatory? Does every column have a column heading? Are all abbreviations; special use of italics, parentheses, and dashes; and special symbols explained? Are all probability level values correctly identified, and are asterisks attached to the appropriate table entries? Is a probability level assigned the same number of asterisks in all the tables in the same document? Are the notes organized according to the convention of general, specific, probability? Are all vertical rules eliminated? If the table or its data are from another source, is the source properly cited? Is the table referred to in the text? The following image illustrates the basic structure of tables. Numbers. Number all tables with Arabic numerals sequentially. Do not use suffix letters (e.g. Table 3a, 3b, 3c); instead, combine the related tables. If the manuscript includes an appendix with tables, identify them with capital letters and Arabic numerals (e.g. Table A1, Table B2). Titles. Like the title of the paper itself, each table must have a clear and concise title. When appropriate, you may use the title to explain an abbreviation parenthetically. Headings. Keep headings clear and brief. The heading should not be much wider than the widest entry in the column. Use of standard abbreviations can aid in achieving that goal. All columns must have headings, even the stub column (see example structure), which customarily lists the major independent variables. Body. In reporting the data, consistency is key: Numerals should be expressed to a consistent number of decimal places that is determined by the precision of measurement. Never change the unit of measurement or the number of decimal places in the same column. Analysis of Variance (ANOVA) Tables. The conventional format for an ANOVA table is to list the source in the stub column, then the degrees of freedom (df) and the F ratios. Give the between-subject variables and error first, then within-subject and any error. Mean square errors must be enclosed in parentheses. Provide a general note to the table to explain what those values mean (see example). Use asterisks to identify statistically significant F ratios, and provide a probability footnote. Regression. Conventional reporting of regression analysis follows two formats. If the study is purely applied, list only the raw or unstandardized coefficients (B). If the study is purely theoretical, list only the standardized coefficients (beta). If the study was neither purely applied nor theoretical, then list both standardized and unstandardized coefficients. Specify the type of analysis, either hierarchical or simultaneous, and provide the increments of change if you used hierarchical regression. There are three types of notes for tables: general, specific, and probability notes. All of them must be placed below the table in that order. General notes explain, qualify or provide information about the table as a whole. Put explanations of abbreviations, symbols, etc. here. Example: Note. The racial categories used by the US Census (African-American, Asian American, Latinos/-as, Native-American, and Pacific Islander) have been collapsed into the category “non-White.” E = excludes respondents who self-identified as “White” and at least one other “non-White” race. Example: a n = 823. b One participant in this group was diagnosed with schizophrenia during the survey. Probability notes provide the reader with the results of the tests for statistical significance. Asterisks indicate the values for which the null hypothesis is rejected, with the probability (p value) specified in the probability note. Such notes are required only when relevant to the data in the table. Consistently use the same number of asterisks for a given alpha level throughout your paper. 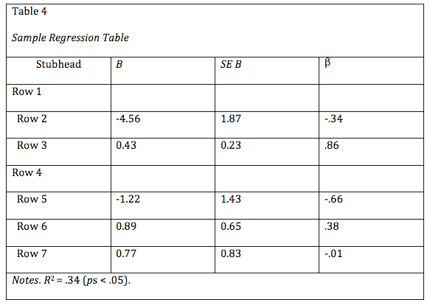 If you need to distinguish between two-tailed and one-tailed tests in the same table, use asterisks for two-tailed p values and an alternate symbol (such as daggers) for one-tailed p values. If using tables from a source, copy the structure of the original exactly, and cite the source in accordance with APA style.